In September 2013, the Benckiser Foundation Future launched the first German Social Impact Bond (SIB). Services have begun to be delivered under an innovative service model that brings together a range of organisations and interventions with a track record. The services works with young people who have disengaged from education and employment, to help them enter training or employment. The targeted outcomes are placement of at least 20 members of the target group into work or apprenticeship for more than 9 months during the timeline of the project. To achieve this goal the service delivery organisations will have to work with approximately 100 young people. no contact with an employment agency over the last two years or no participation in agency programs over the last two years. The Bavarian State Ministry of Labour and Social Affairs, Family and Integration (StMAS) will pay for outcomes once they have been achieved. The Ministry holds a contract with special purpose vehicle called Juvat. Juvat, derived from the Latin juvare, translates the central hypothesis of the program: It works. This is a pilot project for the Ministry, which they are referring to as “JuMP – youth with perspective”. 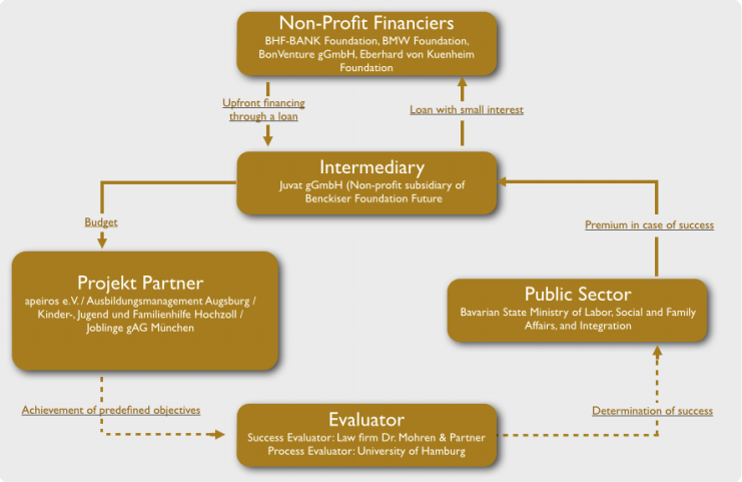 There are four foundations investing in the SIB:BHF-BANK Foundation,BonVenture (a social venture capital fund),BMW Foundation Herbert Quandt , and Eberhard von Kuenheim Foundation – the Foundation of BMW AG. The investment total is not public information. The law firm Dr. Mohren & Partner will independently evaluate whether targets have been reached and payments should be made. Additionally, the Faculty of Economic and Social Sciences at the University of Hamburg will perform a process evaluation. Juvat.org has released an overview of the SIB in English as a PDF. Do you know what is the contract duration of this SIB? and how is it paid?? The SIB will run from Sept 2013 until the end of 2015. Payment details should be released soon. This information (and much of that in the post above) is gratefully passed on from the guys at Juvat who have been kind enough to answer my questions!